Posts related to a school. Erin (Swartsel) Fogler, Nursing Class of 2010, was name Beginning Practitioner of the Year by Dr P Phillips Hospital. Back in 2008, Craig Hanson and I participated in a debate the night before the election on whether conservatism or liberalism was more Christian. In preparation for the debate I came across the Mises Institute, and I haven’t stopped learning since. They have incredible resources for economics and history. 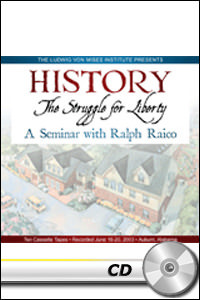 Lately, I’ve been listening to Ralph Raico’s lecture series, History: the Struggle for Liberty. It’s a history of the Western world focusing on issues related to liberty. Dr Raico attributes the rise of liberty in Europe in part to the separation of power between the Church and temporal rulers. Rulers have always claimed divine authority, and in some cases, outright divinity. The separation of religious and state authority in Europe helped create an environment where competing centers of authority allowed the rise of unprecedented personal liberty. His delivery is engaging, and I highly recommend this series to anyone. Are you coming? Then RSVP below! Want to send an additional message?